In what is a significant development for the 2013 race the nearly 1,200 member strong political youth organization, Druk Miser Nazhoen Tshogpa (DMNT) has joined the youth wing of the Peoples Democratic Party (PDP). Though the DMNT and the opposition party were in touch earlier the DMNT in early December 2012 dissolved DMNT and its members then joined the PDP youth wing. DMNT had come into being after the earlier Druk Miser Tshogpa party transformed itself into a youth political organization with mainly youth members who were not a part of the original DMT. It is understood that the founder of DMT and one of the founders of DMNT Dasho Penjor Dorji has left DMNT. “We have received assurances that all the members of the DMNT with 1,200 core members and many other members want to and will join the PDP. However, I don’t want to transfer memberships from one organization to another and instead I have insisted on meeting each and every youth member to personally confirm their concurrence with PDP ideals and their support for the political party. In this context I have already started meeting them individually and am considering meeting them in larger groups too,” said the Opposition leaders. He said that so far everyone he had had met very readily agreed to be with the PDP. Earlier when DMNT was formed one of their pre conditions to joining any political party was the party’s acceptance of their 30 point agenda mainly focused on alleviating youth unemployment and signing a MoU with the party. However, the Opposition leaders said that DMNT had joined PDP’s youth wing without any pre conditions. “They are fully satisfied that the aims, objectives and policies of the PDP are consistent with their own aspirations,” said the Opposition Leader. He said that it is a bit too early to announce what PDP’s manifesto holds for the youth but PDP would surely address each and every one of the concerns of the youth including ending unemployment, rooting out growing corruption and nepotism , providing equal opportunity , enhancing quality education, sports, and training and, addressing drug and alcohol abuse. With DMNT being the largest and fastest growing youth political group and with youth (18 to 25) representing 30 percent of the electorate for the 2013 elections, the merger is expected to pay rich political dividends for the PDP. The Opposition Leader said that since the youth formed the largest group of electorate for 2013 it was the responsibility of every party to reach out to them. “It is common knowledge that youth make up the largest section of the electorate and it’s no secret that increasingly more and more of our youth feel disenfranchised. They cannot relate to and trust the existing leadership and most of them feel and express an utter lack of confidence in their future. Therefore it is critical that our youth become more politically active and contribute towards defining the future of our country,” said the Opposition Leader. He said that in terms of party strength there is no denying the fact that the youth group will have contributed immensely towards the overall strength of the party. He said this would be good for the PDP to increase its membership base and have the future of Bhutan identify with the party. The erstwhile DMNT is expected to pack a punch as its large numbers are made up of mainly educated but unemployed graduates from rural areas all over the country in the age group of mainly 20 to 26. The group due to its wide base and mainly humble socio-economic background hold the potential to not only influence the youth vote but also the rural votes of their rural parents and relatives. The group also has a very strong networking system with each member recruiting five more members in an increasing chain. 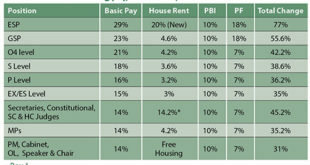 The main issue for DMNT and its members is unemployment. 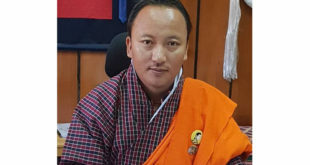 “Our youth member leaders are generally unemployed out of choice to support the party-they are passionate about what they believe in and they believe in securing a better future for the youth of Bhutan,” said the Opposition Leader. “They are very hard working and are willing to put in long hours free of cost in spite of the fact that they are unemployed. This is some serious political commitment and I respect them for that and I am absolutely proud of our youth,” he added. The Opposition leader acknowledged that the DMNT members were not the ‘privileged few’ but were from rural areas and represented the ‘common man’. He also said that it was good for the country as it is healthy to have youth concerned about the country and also be doing something about it and it would also be healthy for democracy as there would be more participation in the democratic process. PDP, as of now, has plans to use their new youth muscle in mainly educating other youth about the democratic process and about the importance of taking part in that process. “Our Youth members have indicated that they want to play an active role in social issue of the day including unemployment, corruption , nepotism , homelessness, garbage, drug abuse, etc, etc. We will consult them and start implementation in due time,” said the Opposition Leader. The Opposition Leader said that in the last five years the ruling DPT government had failed the youth of Bhutan. He also said that among the youth there is a perception of growing corruption and nepotism, lack of transparency, favoritism, high handedness, a sense of growing autocracy and a sense of helplessness that they cannot contribute to being part of any solution. “Yet, they are energetic, have youthful energy and are extremely patriotic and desperately want to serve the interests of our King, Country and People in addition to taking care of their immediate families,” said the Opposition Leader. This is a very good news for the people of Bhutan and PDP in particular. I feel PDP should get an opportunity to run the govt and prove that they are also a party of the common people and they mean business. DPT has done its best. We have seen them five years of ruling. Unless PDP get a chance, we cannot say which one is better. For equal opportunity, we should give chance to PDP and see what they does. Joinion of DMNT is a huge boost to PDP and this is going to make a huge difference to the outcome of 2013 election.All the best PDP and also to all other parties and DPT. Unfortunately in the world of politics, equal opportunities like you propose are seldom the order of the day. And the 1200 members going to make a big difference to the outcome of the elections is just myth. I did not say that you can’t vote for any party you want to vote for, I just said that it does not work the way the first poster hoped it would. dnt blame others wen u urself is hopeless……learn to appreciate…..
Haha, clutching at straws all over again, how much more pathetic can this so called newspaper get. Tenzing Lamsang, it is time you take a hike. 1200 youth, I guess DPT is shivering in their boots, a non story at the best! Anti-DPT, pro-PDP paper is desperately trying to sweet-talk the public that the founder of DMNT who has a criminal record had left DMNT. How pathetic will this paper and the opposition get? PDP sure seem to be back on the track with what it did before 2008 election. Some people will never learn of course. 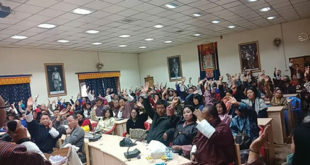 I believe members of DMNT have been misled by dzongda penjor who has promised these youth jobs and these youth who are posed in that photo had actually gathered on that day to discuss on strategy to address youth unemployment. Somebody should do some research on DMNT as it is intended to serve the interest of the founding member. if dzondpa penjor who is the mastermind of this group is so passionate about youth – why didnt he contribute to that when he was in power. Why now when he has retired – should he be so concerned about youth unemployment? There is something fishy in this whole business! A shinning star following the PDP. Must be blessing of Karmic actions being a true, humble, hardworking, clean leader and genuine. Wow! what a positive indication for the PDP. This is a steel backbone assurance of success in future. Good luck. “Miser”? Maybe they should use dzongkha script or change it to “Mitser” or “Misere”. I think it is healthy to have younger people take part in politics. 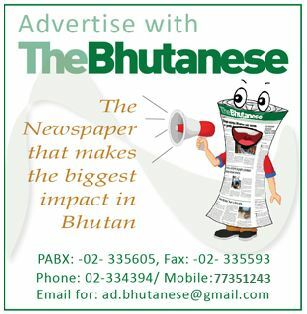 After all the youth will shape the future of Bhutan’s democracy. However, one thing to be weary of are the impressionable minds of the youth and what ploys parties use to sway them. We want the future politicians of Bhutan to have the utmost morals and ethics right? Good Job for PDP because these rogues will held their ideology to ransom….. Yes this is good news for democracy. After all DPT has the advantage of having been in power for the last 5years. With just two members in the Parliament for the last 5 years and PDP has has made our democracy so meaningful. Next 5 years PDP receiving the mandate to govern the country will be good for our democracy. Yes this is good news for democracy. This will definitely boost the strength of PDP.There should be parties with equal or near equal strength to maintain check and balance. Otherwise, a single strong party can lead to autocracy, dictatorship and corruption. remember absolute power corrupts absolutely. Absolute power is no good for democracy. Here some people understandably DPT supporter cry foul whenever some good things happened to PDP. But I see no reason to be apprehensive. PDP is no Ngolop or traitor. What has it done to deserve such treatment by Bhutanese people? but if we really care for democracy we should appreciate that strong parties are essential for good health democracy.If you look around, such example abounds that once in power they continue to crave for power and do whatever is necessary to cling to power by even amending constitution in some countries. Let us hope such thing do not happen in Bhutan. Therefore we do need an equally strong opposition party in Bhutan. The voice and concerns of the YOUTH should be heard but the youth representing the public has been a terrible experience. We seldom heard our young MPs stand and speak. They just occupied the space and wasted…. Lobzang Dorji, why don’t you explain how PDP is going to guarantee 100% youth employment, you mean to say that DPT is hiding some jobs or what! DPT is not hiding but not able to create jobs. Even in big projects like hydros we see more of Indian laborers. May be we should give training and prepare them for such skilled and semi skilled jobs. Employment is a genuine problem and with out it we are in for lots of fun! We have crossed this bridge many time before, the jobs being done by Indian laborers are the jobs that none of our Bhutanese youth want, so please give us a break. Actually, it is this newspaper that should be asking PDP how they are going to guarantee jobs for every employable youth, so you can see how biased this paper is towards the PDP. If it were the DPT who said this, I am sure this paper would have questioned them thoroughly. u r real psycho…u ask n u answer it…. ..u need psychritic help…..
U r also a dumbass it seems, the question is 100% youth employment which the PDP is guaranteeing, the answer I want is where are the jobs. If you can’t answer this, better shut your mouth so as to not prove to the world how stupid you are! A very bad omen for PDP…DMNT shud be kept at bay..m worried abt PDP now? Do not trust any Party.